Robert Fulton was an American inventor of the 19th century who developed the first commercially successful steamboat. Fulton was born in Pennsylvania on November 14, 1765. His interest in steamboats originated after visiting an American gunsmith named William Henry in 1777. Henry had learnt about the steam engine being developed by the English inventor James Watt, and he passed this information on to Fulton, who was fascinated with it. During his youth, Fulton lived in Philadelphia where he worked as an artist drawing portraits and painting landscapes to earn money, which he sent back home to his mother. At the age of 20, he bought a farm in Pennsylvania for his mother and siblings to live in. While in Philadelphia, he became acquainted with the famous inventor and politician Benjamin Franklin. At the age of 23, Robert Fulton decided to travel to Europe. He took several letters of introduction from his acquaintances in Philadelphia along with him. He lived with the painter Benjamin West in England, who was a close friend of his father’s. He continued to paint and held an exhibition at the Royal Gallery in London in 1791. His interest in inventions soon led him to abandon painting and he started working on his inventions. He published a pamphlet about canals and also invented a dredging machine, and several other inventions that he patented. He also began working on a design for a steamboat. In 1797, he went to Paris to study French, German, mathematics and chemistry. By that time, his fame as an inventor had already been established. While there, he began to design a torpedo and a steamboat. He also became acquainted with an American engineer named James Ramsey, who had his portrait done by West. Ramsey and Fulton became friends and he influenced Fulton’s research and work in developing the steamboat. In 1800, he demonstrated his first boat named the “Nautilus” to the French Navy, but his design failed to impress them. He kept at it and on his return to England in 1804, went on to develop submarines for the British Navy. In 1806, he returned to America after being away for 19 years. In America he was considered a hero and was given $5000 by the US Congress for furthering his research work. President Jefferson himself requested Fulton to build a canal in Louisiana. 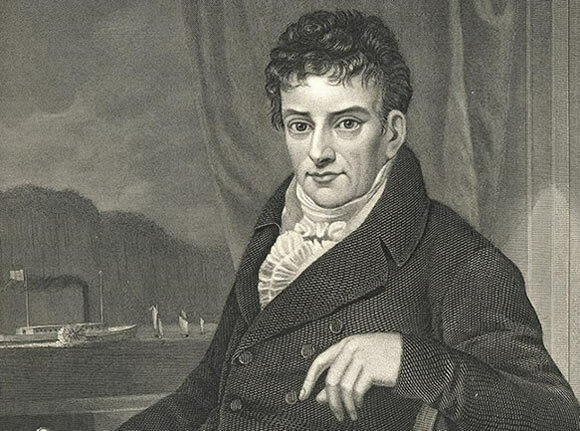 Robert Fulton then obtained a patent for his steamboat in 1809, which was granted to him in a record 42 days and another one next year after making some improvements to his initial model. He was granted exclusive rights for steamboat transport on the Hudson River by the state of New York. He also built the world’s first steam powered warship named the “Demelogos”. It was 300 feet long, 200 feet wide, had double hulls and 120-horsepower, underwater cannons and 44 guns on deck. Fulton obtained a patent for his ship in 1813 but the project lay idle after the War of 1812 ended. Fulton died in 1815 from a severe chest infection brought on by a cold. His death was mourned in Congress and also observed in New York City where businesses were shut down for the day. He had his fair share of critics, however, and many people considered him nothing more than a business opportunist. Yet he was undoubtedly one of the greatest influences in the development of the steamboat and his legacy was honored both during his life, and posthumously as well.